A metaphor for masculine hunger and violence is loose in the dark forest, a bottomless appetite for carnal destruction preying on the weak. Faced with this upsetting symbolic rejection of civilized cultural norms, Collinsport Animal Control sets up a traffic stop and hopes for the best. And now we’ve got a new kind of juvenile in detention, a crossbreed nightmare on two legs dressed in grown-up clothes, snarling and clawing at anyone foolish enough to approach its cage. So here’s my question: How do you think they got him out of the bear trap and into a jail cell? But Dark Shadows has evolved beyond the need for comprehensible transitions; each scene is presented to us inividually on a platter. No sequence of events could possibly have led up to this moment, and yet here we are. The first time we heard of law enforcement getting involved was yesterday, when we saw a police officer setting up traps, as Reverend Trask looked on. The officer explained that there were twelve traps scattered around in the woods, which is plenty. The cop didn’t explain how they were planning to lure the werewolf; it must have been through sheer animal magnetism. 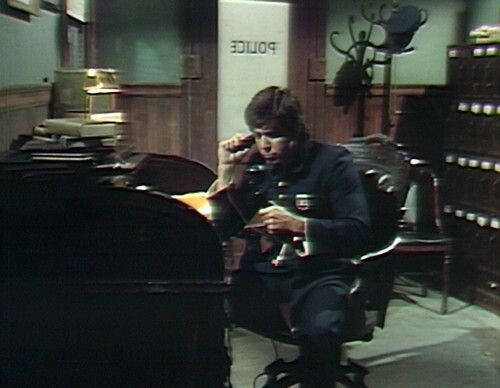 So now we’ve got another day player trainee calling up Collinwood, and asking for Trask. “The sheriff asked me to notify him that the animal has been captured,” the cop says, because it’s only polite to issue late-night police bulletins to concerned local residents. Trask’s not available, but Edward takes the call, and when he hears that the creature’s in a cell, he says, “I’ll be there as soon as I can!” and hangs up. This is apparently just fine with the police, who must have figured if they have a supernatural man-thing in custody, then sooner or later somebody from the Collins family would come down and pay bail. Then Edward is at the Old House, pointing a gun at Magda’s midsection. 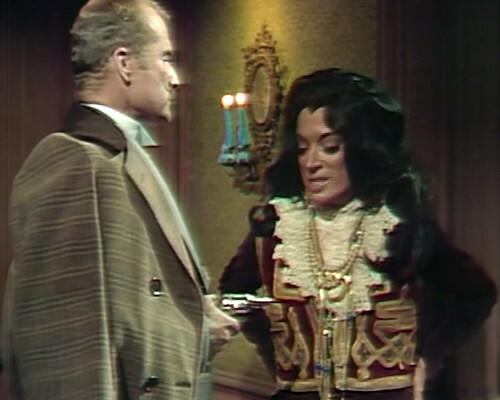 It’s not clear why he came over, and Magda absolutely refuses to acknowledge the revolver until he specifically draws her attention to it. Then he keeps the gun aimed directly at her for the rest of the three-minute scene. It doesn’t matter. This is dream logic; we’re lucky they’re not at a shoe store that looks like your grandmother’s house. But he doesn’t seem very determined to get information out of Magda — she’s notoriously tight-lipped, anyway — so instead, he tells her every single thing that he knows about anything. He believes the creature is a lycanthrope, it should turn back into a man at daybreak, and he’s going downtown to watch the process happen live. I’m sure the police will love having Edward charge into the station without a previous appointment, wielding a loaded weapon. Although they might all be out celebrating by then; this is the first justifiable arrest they’ve made all year. 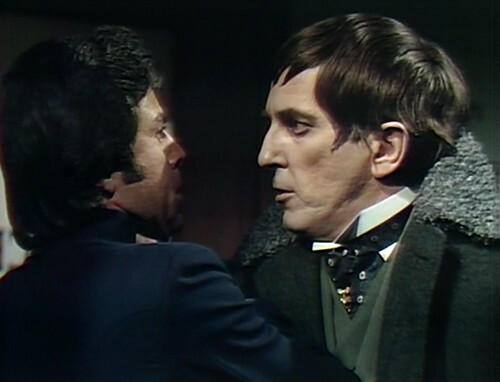 Edward storms out the way he stormed in, and then Barnabas pops by for a visit. Magda fills him in on her evening activities — she tried to use the Hand of Count Petofi on Quentin before his transformation into the wolf, but it didn’t work, and now he’s in lockup. “Where is the Hand?” Barnabas asks. She nods, although technically it already is somewhere, and that’s why she has to go get it. But she comes back with alarming news — the Hand is gone! 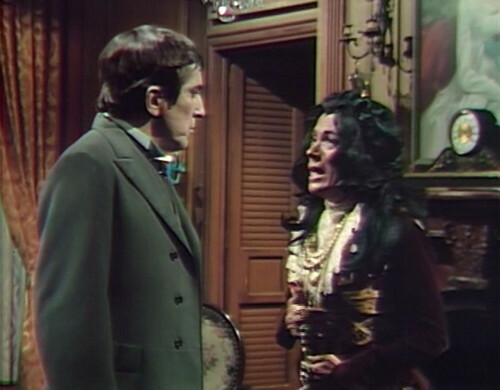 “That you completely forget Evan Hanley was in the house!” Barnabas is furious. He forgot about Evan too, but he’s a busy man; he doesn’t have time to keep track of all the supernaturally disfigured attorneys who wander freely around his haunted house. We last saw Evan two episodes ago, and nobody’s mentioned him since, so this comes as a surprise, for Magda and for us. It’s the dream logic where you suddenly realize that your History term paper is due, and you completely forgot you were even taking History until just now. You’ve missed all the classes, and you don’t have a notebook, plus Evan Hanley broke into your dorm room and stole all your stuff. And here he is, back home. He smuggled the Hand out of the Old House somehow, and then walked all the way downtown without anybody noticing that he’s got an eyeball hanging out. But anything that happens offscreen is a blur; the only thing that matters is the eternal ludicrous now. “You have no business here!” Evan shouts. And then the scene just continues on. He does have the Hand, it turns out. I don’t know what happened to the book. 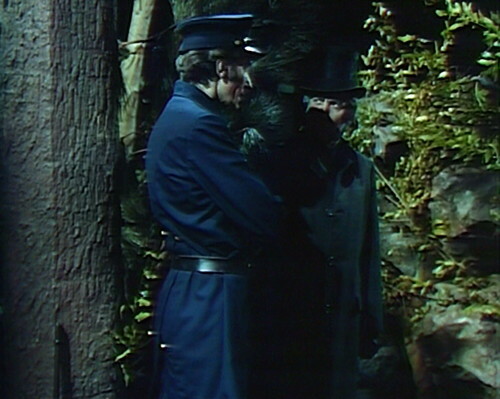 Meanwhile, Barnabas appears at the jail and hypnotoads the police officer into handing over the keys. And the wolf — who up until now has treated every human being it runs across as a potential food source — just stands there and looks at Barnabas hopefully, making little snuffling noises that basically translate to Awesome! Thanks, bro! But then Edward comes in and interrupts the jailbreak, which is kind of a relief, since Barnabas didn’t have a well-defined step two. I can’t imagine how the werewolf would get out of the building without savaging a couple police officers, and once he’s outside, then what? There’s eleven more bear traps out there. Sure, the deputies probably stumbled into a few of them accidentally while putting on their alluring lady-werewolf disguises a la the Warner Brothers cartoons, but there’s got to be at least half a dozen left. They don’t have that many deputies. So the dream ends in confusion and disaster, as nightmares do. Magda didn’t get the Hand, and Barnabas didn’t get Quentin out of stir, and that History term paper is just not gonna get written. “Then your mission will have failed,” Magda sighs. Right on cue, the Convenient Rooster crows another sunrise into the sky. And the dream melts away, as they always do, leaving us holding nothing but vague fragments, and maybe a commercial or two. There’s studio noise when the policeman tells Edward on the phone that the animal’s been captured; there’s a door opening, footsteps and what sounds like a bell ringing. 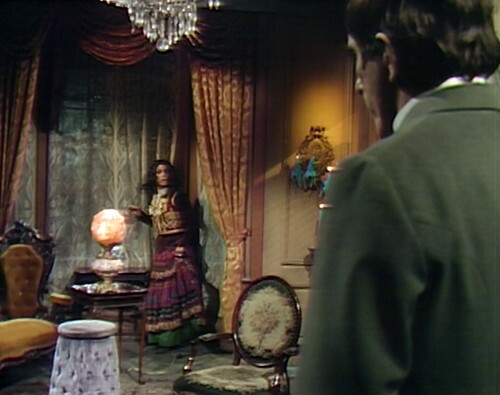 When Edward comes to the Old House, Barnabas’ cape and cane are hanging on the coatrack at the beginning of the scene. Once Edward leaves, Barnabas appears. After his conversation with Magda, he takes his cape and cane from the coatrack, so it’s unclear why he didn’t have them in the first place, or why Edward didn’t notice them when he came in. There’s a tight close-up on Barnabas when he’s talking to Magda in act 1, lasting for three lines, and he has to look at the teleprompter for each line. At one point, he’s staring directly at the prompter, turns to look at Magda when it’s his line, and then has to check the teleprompter again before speaking. 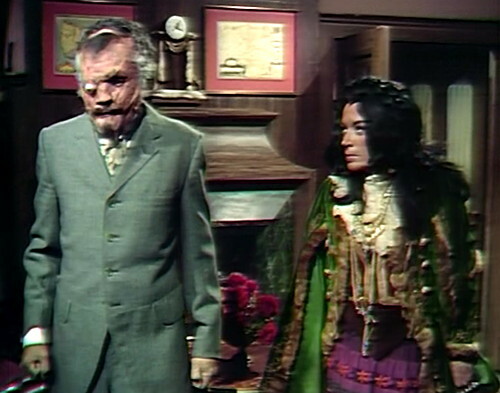 Barnabas takes his cape and cane from the coatrack, which wobbles back and forth quite a bit. Evan picks up a book from his desk, and another book drops on the floor. The door at the jail is blown open by magical wind. When the policeman tries to shut the door, it rattles but doesn’t actually close. 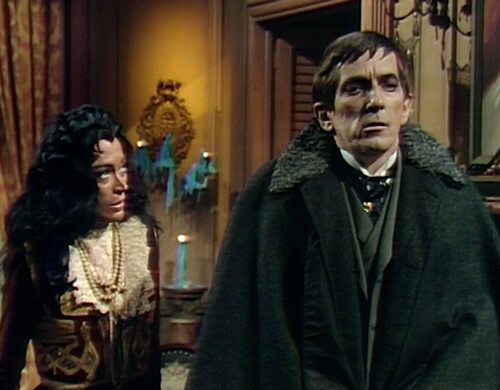 Barnabas: — in a way, I’m sorry that she isn’t living now. Louis Edmonds is credited as Roger Collins instead of Edward, for three days straight. 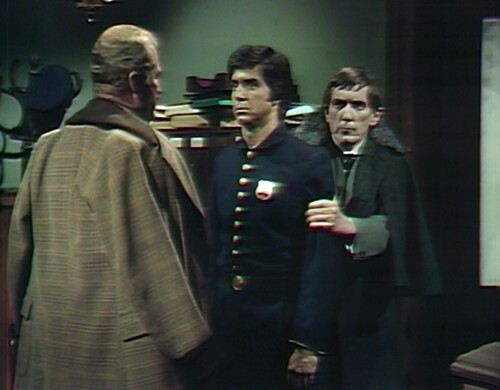 There are “Policeman” roles in three episodes this week, each played by a different actor in their only Dark Shadows appearance. Apparently, it’s hard to keep a day player policeman these days. Today, it’s Paul Vincent, who had small TV roles in Felony Squad, Edge of Night and How to Survive a Marriage. He also played a waiter in Arthur, if that helps. I think they got him out of the bear trap and into the jail cell by promising him Scooby snacks. Grayson’s little tags at the end of her sentences (rendered here as “huh”) were one of my favourite things about the Magda character. Now, if they put out a single of David Selby singing “Pound puppies”…. The funny thing about the werewolf story is that, unlike that of the vampire, it isn’t exclusively about the night. Just last month in November, there was at least one day, in the middle of the day, 2 pm or so, where there was a full moon that was higher in the sky than even the sun. Well, I know, suspension of disbelief and all that. But, suspension of moon phases? I mean, running around like that in broad daylight, turning doorknobs and storming in and out of hotels and mansions and the like, the werewolf could be easily caught. But the moon always setting just as the sun is rising? So now the world really is upside down. But, who knows? Maybe in 1897 the moon didn’t behave as it did. I mean, in 1897 in small town Maine they had policemen with long hair and sixties hippie sideburns, so what do I know? I have seen a full moon in the daytime. 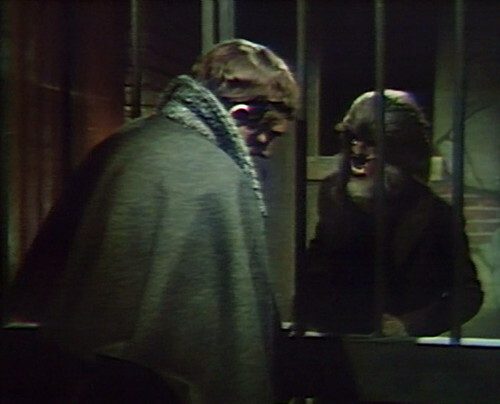 So I guess we have an explanation for why the Collinsport law enforcement is so ineffective; Barnabas has them all standing around like window dummies.